I will state this here and now, I make no apologies for using convenience foods to help me out during busy weeknights or plain ole lazy days. I know there are lots of folks out there who preach about making absolutely everything from scratch and all the benefits of doing so, and knowing what is going into your food and so on and so forth. I appreciate that argument and respect it but for many folks that I know, it’s just not a reality. Most of them are working their little patoots off inside and outside of the home nearly everyday of the week. Half the time they feel guilty because they are running thru the drive-thru more often than they would like and folks make them feel bad about it. Well, I’m not one of those folks. I understand parent’s guilt. And truthfully, I’m tired of the food shaming that goes on. As if we don’t have enough worries these days! I understand Moms and Dads who work hard and come home so exhausted it is all you can do to just peel your clothes off and hop into bed. But you still gotta help your child with their homework, run them to after school sports activities, and then get them to bed at a good time. Oh, and in there somewhere you gotta feed them. I understand grocery shopping with antsy, tired children while trying to flip through coupons and grocery lists so long you’d rather just pick a pizza up on the way home. I understand not being able to afford all organic food all the time even though you know it is healthier. I understand that you want to pack a school lunch for your child everyday of the week and you want to be the parent that makes all the super healthy, super cute lunches that you see in magazines. But some days you hand your child a couple bucks and tell them to buy lunch because you didn’t have enough time last night or this morning to make it. And then you feel guilty because you see what all the “cool” Moms made for their kids. I understand and I’m with you. And you need to stop feeling guilty. You work hard, you love your child and you are there for them and you are doing your best. 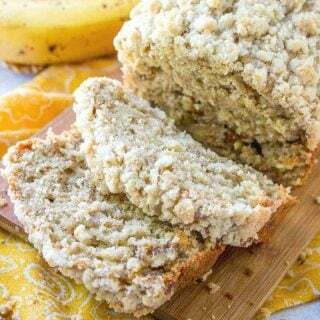 And right now, many of you are just here to print off this recipe and go because you don’t have the time to read all this and comment on it. That’s alright with me. And I understand. And really, who wants to go to the grocery store to buy 15 ingredients to make one meal? I like meals where I can easily remember the ingredients and plop it into my buggy and be on my way. So having said all that. 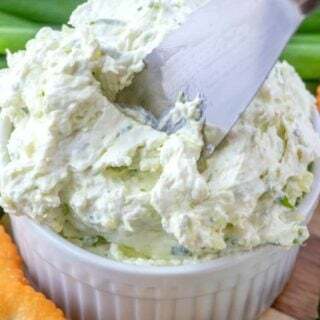 I’m sharing this easy, fun and delicious recipe that has just a few ingredients. And you can tailor this any way you like. Add some fresh spinach or even diced tomatoes in there to jazz it up a bit. Preheat oven to 400 degrees (F). Spray cookie sheet with nonstick spray (or olive oil). Sprinkle with corn meal (optional.) Spread pizza dough on cookie sheet and bake for 5 minutes. 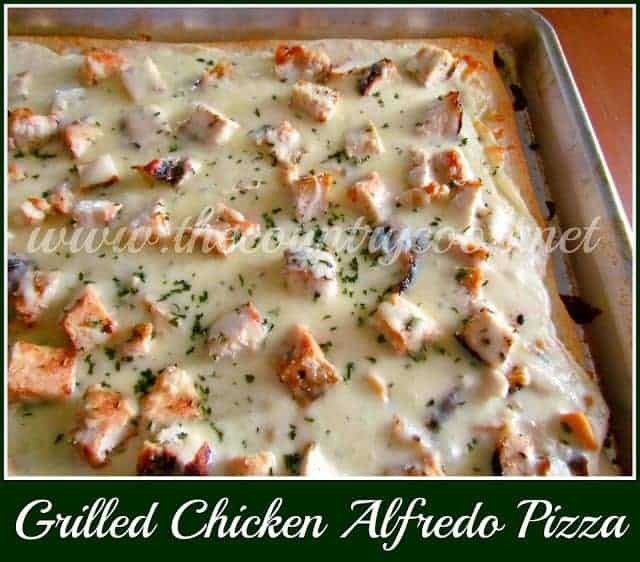 Take out of the oven and spread alfredo sauce over crust (you may not want to use the whole jar). On top of sauce, add diced chicken, onion and spinach (if using.) 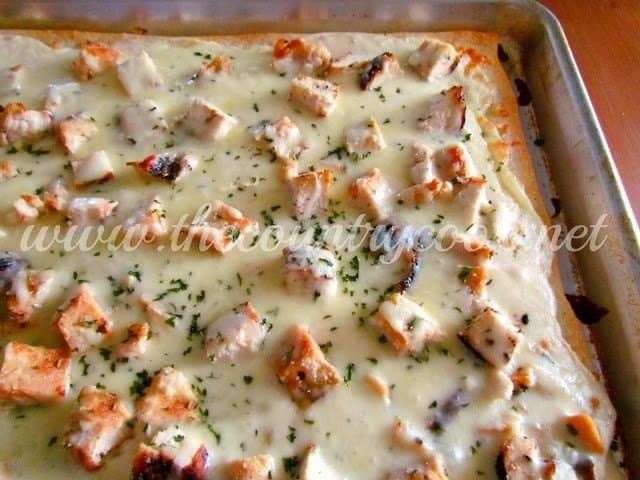 Top with mozzarella cheese. Sprinkle with parsley. Bake for additional 8-12 minutes until cheese is melted and crust is golden brown. Cook’s Note: For another time saver, you can find precooked, grilled chicken strips in the refrigerator and freezer section of your grocery store. I am 100% with ya! When I have the time I'll make things from scratch but most of the time that is just not reality. This pizza looks awesome! 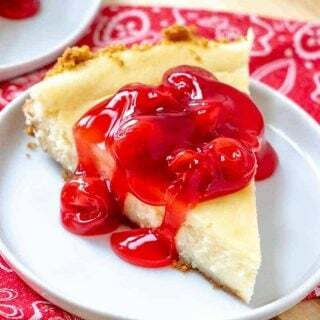 Simple and yummy! Oh do I agree, yes I do!!! You are Totally right..that is why we are blessed with helpers like that awesome pizza crust! Love this whole dish..very creative! Brandie, I just LOVE your voice! You tell it like it is, and there's nothing inconvenient about reading your posts or commenting. In fact, I consider it a privilege. I subscribe to both schools of thought: convenience vs. scratch. As my weekedays go the way of your apt description, I usually default to the quick-n-done – then reserve the higher maintenance/complex recipes for the weekend when Mrs. W can mind the kidlets. Thank you for sharing this and bless you for being…YOU! This is one of the many reasons I love your blog! Thank you for recognizing how hard it is for busy moms. Too many times people forget how hard we try and how busy we really are before they judge so harshly. 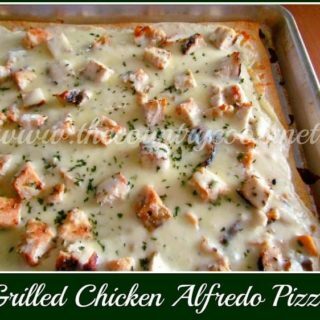 I love alfredo pizza and have been making it for years. Sometimes I add mushrooms and or broccoli to change it up a bit. Got any tips on seasoning the grilled chicken? BUZZED! Great post Brandie. I try to be that supermom but sometimes I am just to tuckered out to do more than throw something into the microwave. This is perfect for those nights when I want something quick to prepare. I read the whole rant – but I agree so much – even though I don't have young children at home anymore I remember how it was!! I always felt like if I were making the effort to cook something, any shortcut I could use was to my advantage to have a little more time!!! Time is what we all want more of anyway. This recipe sound yummy – just keep those shortcuts coming – I still use them even now that I have more time!!! LOL Thanks for all you do! 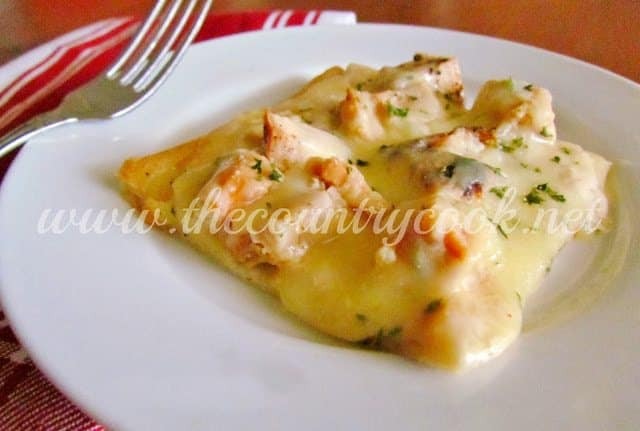 We make a chicken alfredo pizza (basically the same as yours) and love it! It is fun to have some other versions of pizza instead of the same kind all the time. I clicked over from the Shabby Nest. 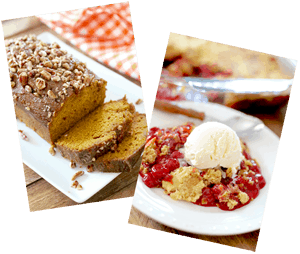 Love all your recipes…yummy and simple. I agree with you, also. I try the 80/20 rule (when I can). 80% make from healthy and/or scratch but it isn't always possible…especially when I am the taxi for football season. LOL Thanks for sharing! You said it! Way to go! Life is busy, people do what they can, and that isn't always made from scratch everything. Nothing wrong with convenience food! This pizza looks fantastic for convenience food! Amen, sister. What a wonderful post. I've had people come by my blog and send me messages about the nutritional value in what I'm making. Honestly, I get all the foods on the food pyramid and I'm okay with that. And the organic argument is totally respectable, but it IS expensive to eat that way. I always appreciate your recipes and words. Have a great weekend, Brandie! Well said!! I'm all about the shortcuts, especially with pizza. I almost always buy the refrigerated dough from the store. It tastes fresh and just as good as if I made it. Especially on the weekends, pizza is a fun meal that I don't want to take forever to make! I agree with you. Your pizza looks wonderful. Will try this. Looks simply delicious and best of all, EASY to remember at the grocery!.. 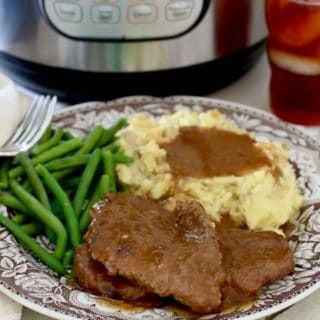 i will definately be using this recipe!..this is exactly why i love your page/site..awesome meal ideas for the busy mom!..thanks! I just love ya. That is all! What a great twist on regular pizza. I love how you made it with easy quick to put together ingredients! 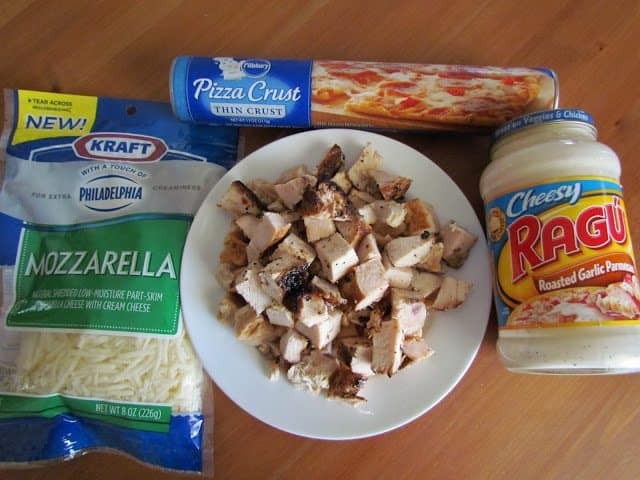 I totally agree with you Brandie – sooo much easier to use mixes sometimes…this pizza sounds wondermous. MMM! Sometimes a red-sauce-free pizza is just right, isn't it?! I won't be home for dinner Monday night, so the husband is already planning his meal. He told me he's making himself a pizza. If he sees this, he's going to want one of these, I know it! Totally with you on this. Some days it's great to go nuts with scratch. Other days you just need to save some time and energy. I also love to just take one day a week off and order in. Such a great recipe. Congrats on top 9! My daughter will love this, her favorite dishes in one! No judging for convenience, that allows more time for chatting with the family or the difference between having a relaxed or an exhausted mom at dinner. 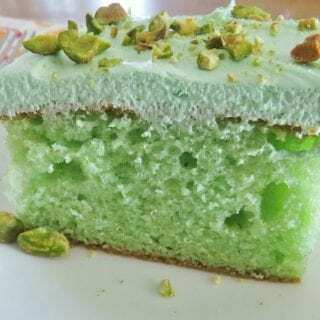 I really love the recipes I've seen here; being creative and keeping the ingredient list reasonable is a talent, thanks! 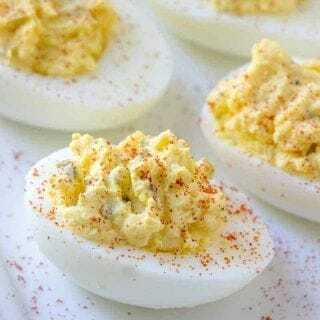 So easy but so yummy!